My eating habits are often strange in the sense that I am not shy about mixing certain food items together and just hoping for the best! It usually works out for me. This week has definitely been putting that mantra to use lately. 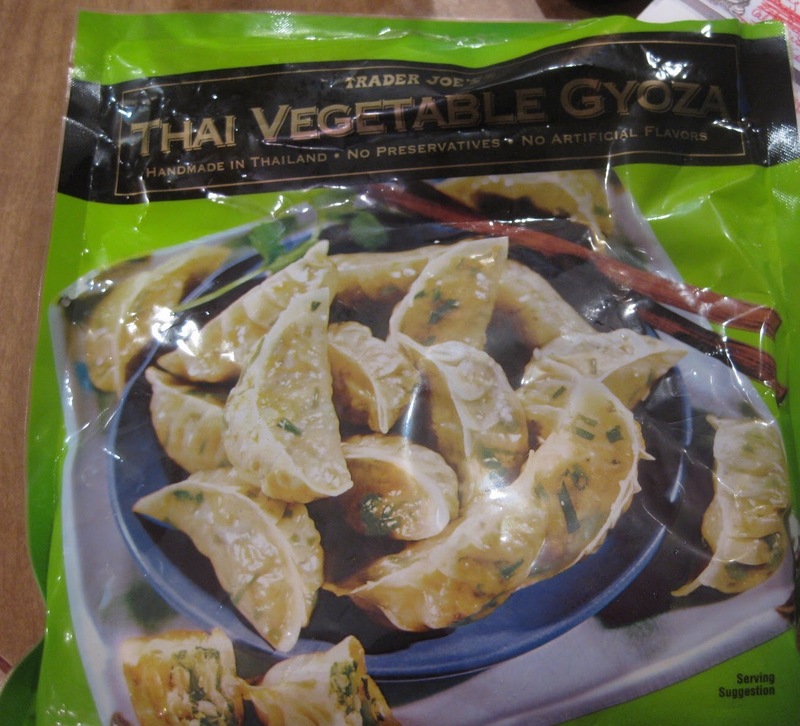 I cannot live without these Thai Vegetable Gyoza from Trader Joe’s. They are the yin to my yang. It says it’s ‘sriracha’ but it’s not. It’s something more. It’s like sriracha 2.0! It’s so incredibly delicious! 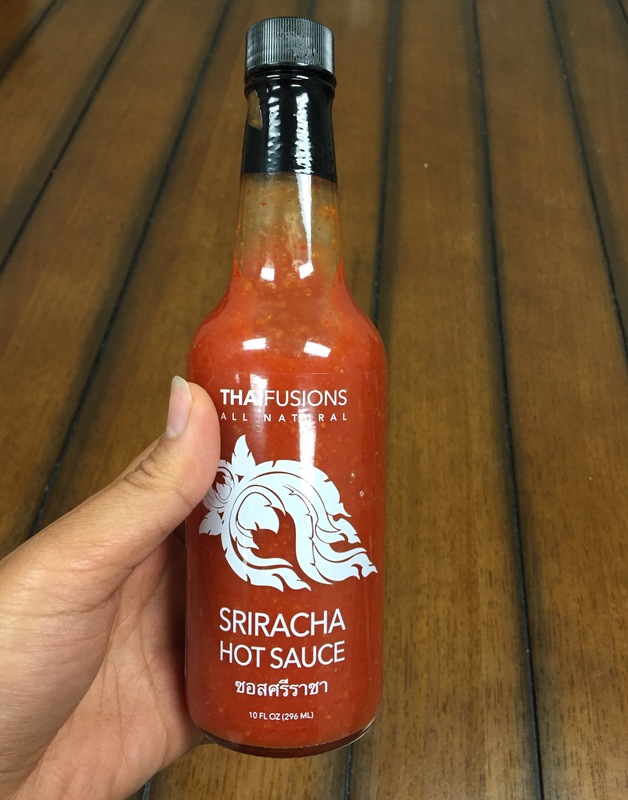 Dare I say it…I like it even MORE than sriracha! It sort of tastes like the spicy liquid that kim chi vegetables sit in but with a slight sweet, garlicky, Thai essence, almost like they mixed the kim chi sauce with sambal olek. I’m not sure if that description means anything to you. Anyways. It’s amazing and I need it by the case-load! By the way, this can be found at Williams-Sonoma and Sur La Table. So, not that I have anything against Lays, but I just don’t buy chips that often. Chips are like crack and I’m just a closet addict. Once I start, I really can’t stop. 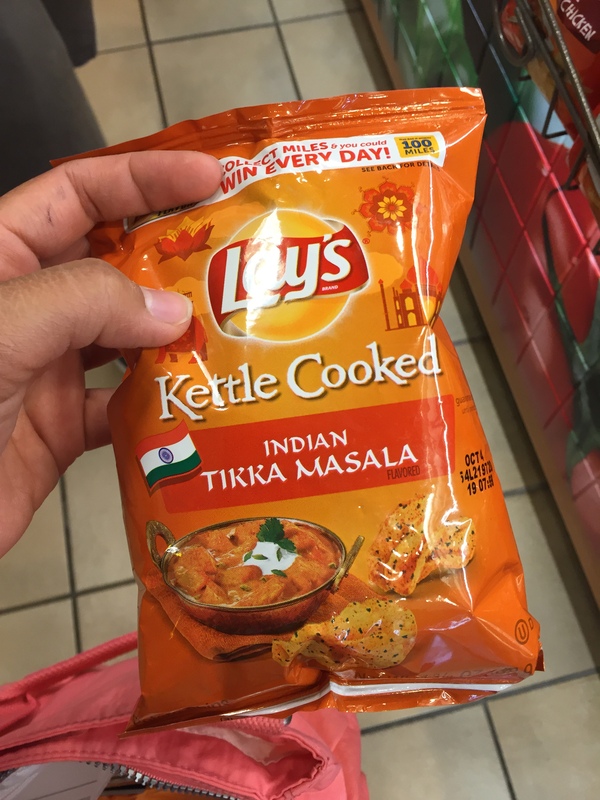 BUT I found these Tikka Masala-flavored chips and I fell hard. I found my soulmate. These chips were AMAZING! They tasted EXACTLY like the Tikka Masala! I was so impressed. Props to you, Lays! Lately, I’ve been eating a whole lot of cereal in the morning. Again, this is not the Cap’n Crunch kind of stuff that we ate as children (not knocking that at all…oh, how I miss the Cap’n!). 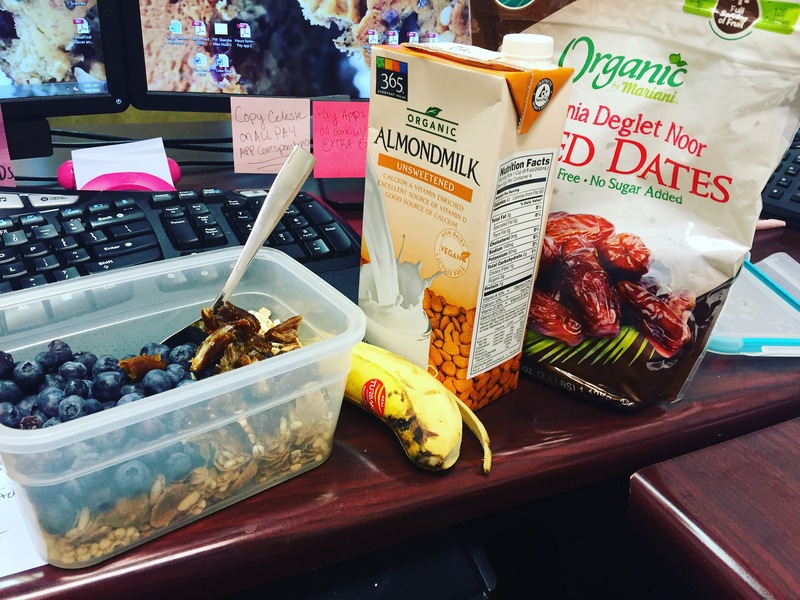 I mix three kinds of low-sugar cereal – usually some sort of whole grain flakes and different puffed grains. I mix the cereal combination with hemp seeds and cinnamon. That base is pretty standard for me. Then I dribble some beautiful, creamy almond butter or peanut butter on the cereal, throw in some fruit (usually a mixture of chopped dates and other fruit) and drown in in almond milk. Heaven. Here is another exhibition of my weird combinations. 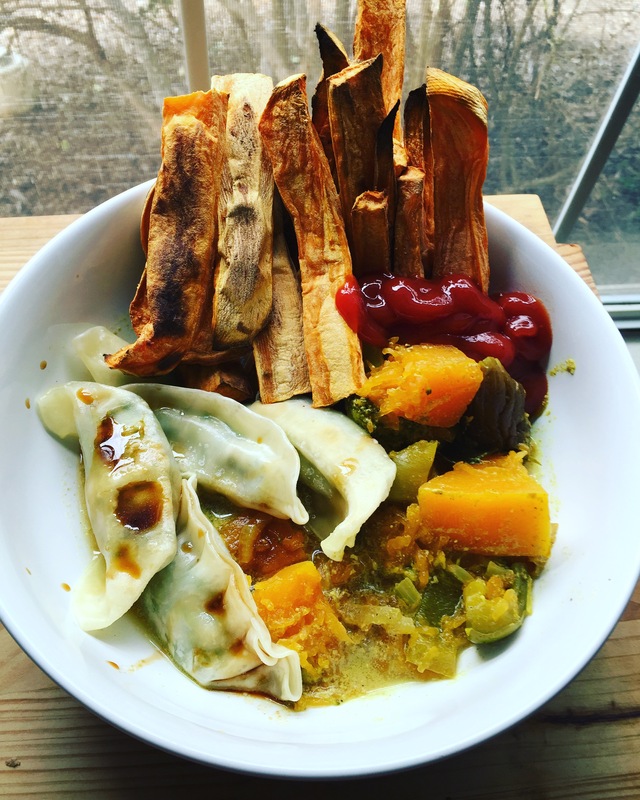 I put some leftover pumpkin curry in a bowl and crowded it with more of those veggie dumplings and I had a hankering for sweet potato fries so I threw that in too. All with a healthy squirt of ketchup. I know. I’m a weirdo. OH MY GOD. 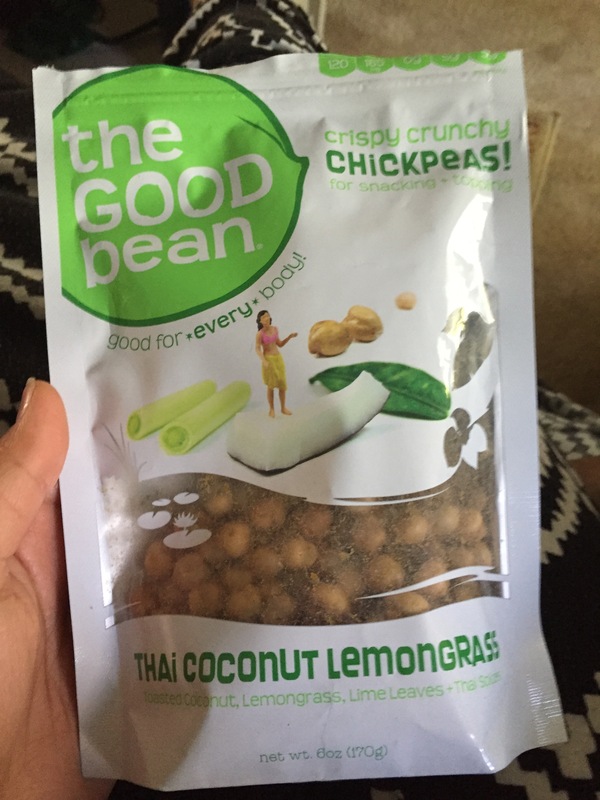 Have you tried these chickpea snacks? They come in all sorts of flavors but…holy cow, they are addictive. You could get lost in a bag of these. They’re salty, crunch, and pretty wholesome since they’re basically just seasoned, baked chickpeas. Needless to say, half these pictures I had to shove my dogs out of the way so I could get a decent shot. It’s a hard life when you’re food-obsessed and an animal lover. Ohmy this sauce ! I’ll have to stop by William-Sonoma to get it ! You’ve done great selling it to me, I already now I’ll be addict ah ! And I feel you for the constant eating, just right now I have a bag of toasted pumpkin seeds near me. Well, if I don’t hide it will be done by the next hour, just by mindlessly eating it ! And these dumplings looks good to !